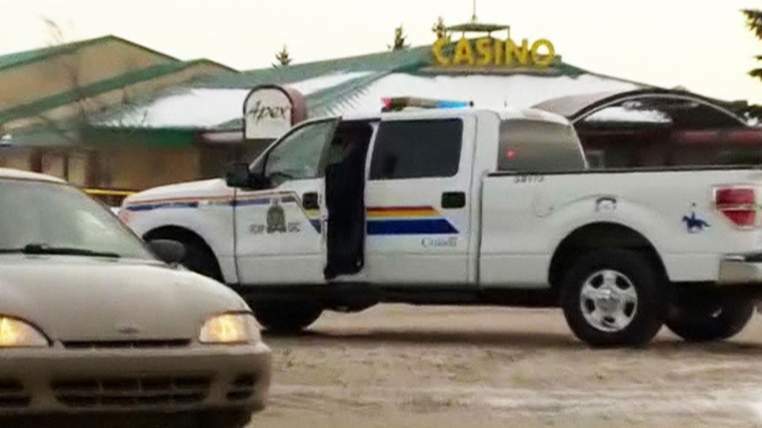 Two Canadian police officers have been seriously wounded after they were shot in a casino in Alberta.Both are being treated in hospital. Constable David Matthew Wynn, 42, is in “grave condition,” while Auxiliary Constable Derek Walter Bond, 49, is in “serious condition,” police told a media briefing. The pair were investigating a stolen vehicle and went inside the casino to look for suspects, quickly coming under fire. They were hit before they had a chance to fire back at the suspect, who fled the scene. The suspected gunman was found dead by police in a private residence in a rural area where officers had tracked him after the shootings. He had apparently forced his way into the house about three miles from the casino. There was no one else in the home. The police did not disclose the cause of death but said they did not speak with the suspect or fire their weapons during their efforts to arrest him in the property. They said earlier that the suspect was a white male aged 25 to 35 and wearing a two-toned blue jacket and jeans. The shooting happened around 3am local time in St Albert, Alberta, northwest of the provincial capital of Edmonton.